Director – Damon Thomas, Teleplay – Mark Gatiss, Based on the Novel by H.G. Wells, Producer – Julie Clark, Photography – Graham Frake, Music – Michael Price, Visual Effects – Rushes, Prosthetic Makeup Designer – Neill Gorton, Production Design – Sabina Sattar. Production Company – Can Do Productions/BBC. July 20th, 1969, the day that the Moon Landing is about to occur. At an English country fair, young Jim wanders into the tent where an old man is showing kinematograph films. The old man, Julius Bedford, tells Jim that the NASA astronauts will not be the first men to set foot on the Moon. During the early years of the 20th Century, he rented a country cottage to get away from the financial ruin of a failed business scheme. He befriended his neighbour, the eccentric inventor Professor Arthur Cavor. Cavor showed Bedford a material he had created that he named Cavorite, which could shield from the effects of gravity. While Bedford saw great moneymaking possibilities in this, Cavor came up with the idea of coating a sphere with Cavorite and using to escape Earth’s gravity and travel to The Moon. The two of them constructed and then launched a sphere. Landing on The Moon, they discovered a world filled with air that froze throughout the lunar night. They were then captured by the insect-like Selenties and taken to their world beneath The Moon’s surface. The First Men in the Moon (1901) was one of the last science-fiction works written by pioneering science-fiction writer H.G. Wells before Wells abandoned writing fiction for social theory. It was a work where Wells speculated about the then-impossible notion of a Moon landing and the society that might be found there. In regard to this latter, The First Men in the Moon was the first work to feature the idea of aliens organised along the lines of an insect hive. Though not as high profile or as wide-reachingly influential as some of H.G. Wells’ other science-fiction works – The Time Machine (1895), The War of the Worlds (1898), The Island of Dr Moreau (1896), The Invisible Man (1897) – The First Men in the Moon has nevertheless accrued a number of film adaptations. Shortly after the book was published, the basic premise was uncreditedly borrowed by George Melies in his seminal early science-fiction film A Trip to the Moon (1902), while there was a silent British production The First Men in the Moon (1919), which is now lost and about which almost nothing is known. The only existing official adaptation was The First Men in the Moon (1964), which was made as a vehicle by legendary stop-motion animator Ray Harryhausen, although this subverted the story into a buffoonish comic playing as was wont of period science-fiction during that era. This new version was produced by BBC tv and is written by and stars Mark Gatiss. Gatiss came to fame as one of the performers/writers in the comedy act The League of Gentlemen, which was later spun out into a cult tv series The League of Gentlemen (1999-2002). He also appeared in/co-wrote the film spinoff The League of Gentlemen’s Apocalypse (2005). Gatiss is a longtime childhood fan of tv’s Doctor Who (1963-89) and wrote and appeared in a number of the unofficial video specials that were made featuring Doctor Who actors – The Zero Imperative (1994), P.R.O.B.E. : The Devil of Winterborne (1995), P.R.O.B.E. : Ghosts of Winterborne (1996) and Unnatural Selection (1996). Gatiss also wrote four novels in the Doctor Who New Adventures series of books, as well two audio plays, followed by a number of episodes of the revived tv series Doctor Who (2005– ). 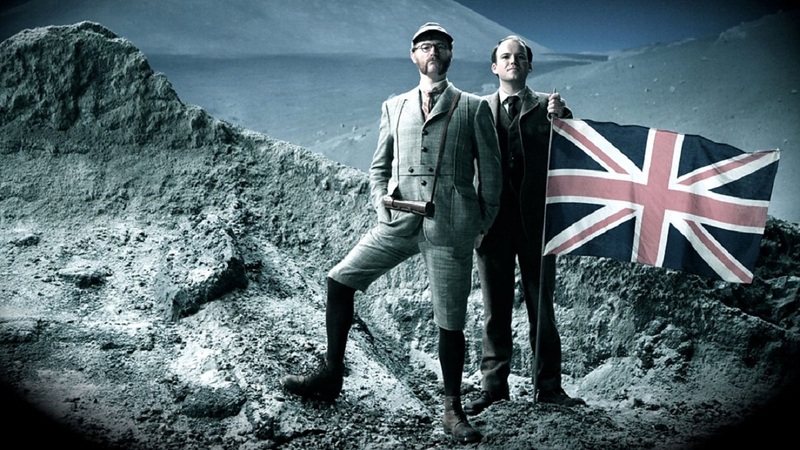 Following the success of The League of Gentlemen, Gatiss began to take on other tv writing work, including episodes of the revived Randall and Hopkirk (Deceased) (2000-1), the haunted house tv series Crooked House (2008), co-creating the modernised Sherlock (2010– ) tv series and playing its Mycroft; writing/narrating the documentary series A History of Horror with Mark Gatiss (2010); writing the tv movie An Adventure in Space and Time (2013) about the creation of Doctor Who; the tv movie ghost stories The Tracate Middoth (2013) and The Dead Room (2018). The First Men in the Moon is a beautifully constructed period tribute to the H.G. Wells novel. Mark Gatiss treats the H.G. Wells novel with an amazing degree of faithfulness – following the story on almost every single plot point, only slightly curtailing the elaborateness of the vision of Selenite society (no doubt due to budgetary reasons). As the 1964 film version did, Gatiss sees that the story is outmoded in the post-Moon Landing era and so backdates it to the eve of the Apollo Moon Landing and frames the film around telling the story of the first Moon Landing in order to make it work. The film acknowledges the original’s lack of scientific vision and comes up with an ingenious explanation about spilled Cavorite having destroyed the Moon’s air. There is even a fevre dream restaging of Melies’s A Trip to the Moon at one point, while the end credits dedicate the film to Lionel Jeffries, the Professor Cavor of the 1964 film, who died in early 2010 six months before the film aired. The production comes with a beautiful sense of Victorian period and the era’s dialogue. Above all, Mark Gatiss captures a perfect sense of wonder in terms of the scientific discovery that is so essential to H.G. Wells’s science-fiction – the way it is presented here, the idea of Cavorite seems almost plausible. There is some superb writing, none more so than the scenes where Gatiss’s Professor Cavor pays tribute to the Selenite society and in his conversations with them and the Grand Lunar. The result is a beautiful production that more than happily dispels the bad memory of the 1964 film. Mark Gatiss himself plays the part of Professor Cavor and, unlike Lionel Jeffries in the 1964 film, plays it seriously but equally makes Cavor into a thorough eccentric. The Selenites are produced digitally (where the 1964 film had them played by children). These involve some economic but credible effects that make the Selenites look unearthly. (Nominee for Best Adapted Screenplay at this site’s Best of 2010 Awards).